If I’m right, it’s just a general shift down, especially from unit of tier 4 and down. 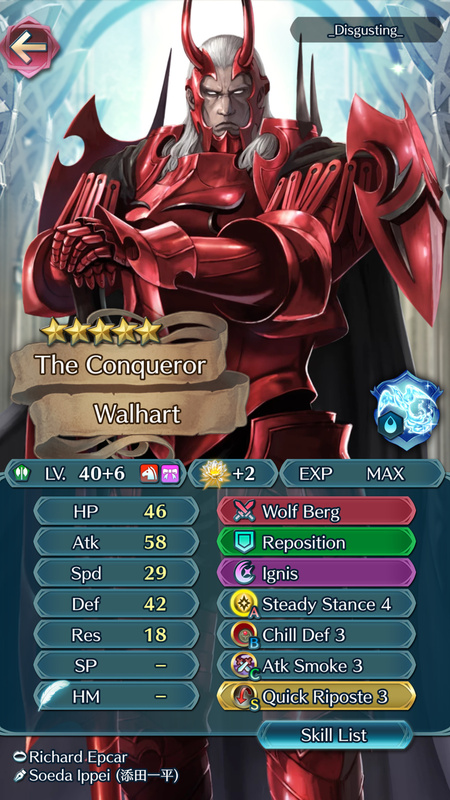 Walhart tier 7 is probably the thing I have the biggest problem with. But in general in kind of paints the picture of some units being too bad to use, while that isn’t the case. It might be me, but characters like Exalted Chrom, Eirika, Lloyd, Hinata, Seliph, Xander, Florina, Fjorm, Silas, NY!Leagjarn, Odin, Bartre, Libra, Soren, Niles, Kaze and maaybe Jaffar all deserve at least tier 5. But still… tier 7 Walhart!? Able to reach 63/31/55/26 without buffs or merges here. Sure it’s with skills, but stat stacking works great on him. You just need some investment. I agree with you 100% concerning Walhart. He’s a beast. However, I also think that Karla deserves every bit of her rank, and then some. She is straight up disgusting. Edit: Fjorm is great too. She deserves waaay more credit than Gamepress gives her. I’m absolutely offended by this disgraceful ‘tier list’. My Walmart can reach 61 Def before buffs. And that’s tier 7?! Disgusting. Honestly, as far as I’m concerned, Arena Offence Tier List needs to die. It can be replaced by a real tier list that doesn’t only care about BST scoring. I don’t understand why every bow users aside H!Jakob is at best tier 5. I have a friend with bow Hinoka and she destroys everything with her prf bow. The same thing for B!Lyn, even she’s not as meta as before she remains strong. Part of the problem might be that the tier list isn’t focussed on something. If that were the case, Seth, Robin and Jaffar would rate way higher due to their support and non-lethal damage. Niles and Kaze having amazing synergy with iceberg and special spiral is also not seen here. Quan is one of the best users of brash assault + desperation, and can be a solid tank. I know I should probably ignore this tier list, but it’s probably the most seen tier list of feh. Noobs are going to use this list and ignore perfectly viable units because of it. But in general in kind of paints the picture of some units being too bad to use, while that isn’t the case. This is addressed directly in the criteria for the tier list. Please read it, that’s what it’s there for! That being said, we’re in the middle of a pretty significant overhaul based on feedback, so stay tuned for that. We are aware of some of the issues and have plans to account for them. As for Walhart…please keep in mind that none of those skills are unique with the exception of Wolf Berg. Consider that you can put those exact same skills on another unit and get potentially similar results. This is why it’s important to remember the above statement in the criteria: ultimately, all units are viable. Some units may be relatively better than others, but given enough investment you can make literally any unit be good enough to clear all content. To be completely honest, I dont think this list is all that unfair. The old list was looking really crowded in some parts, especially in the mid tiers. Although I do have some disagreements, the biggest surprise for me is Merric in tier 4. I think he was tier 5 or 6 before? I could see the jump since he has flier effectiveness for AR, but then why are 95% of archers in a lower tier? Ignoring the tier list is probably best. It’s not even remotely useful. It’s not GamePress’s fault, but there’s no way to accommodate for all build options. For example, any single Tier 6 or lower healer can obliterate Tier 1 armors all day long. Just build who you like. Azama, one of the most tried and true healers in the current meta, is tier 7. He’s actually really tanky, but people fail to understand that. I think he should be placed in either: good case scenario 4, an alright case scenario 5, a worst case scenario 6. Him and Sakura should be higher. Yeah, the ‘every unit is viable’ is a good counter. But I still feel that doesn’t fully justify some placements. 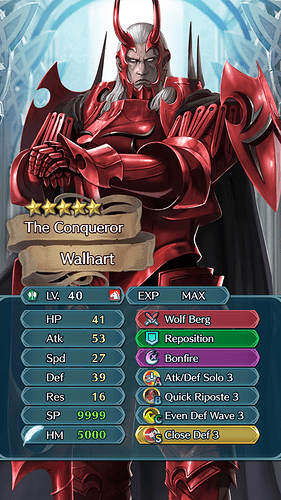 Let’s focus on Walhart, shall we? It gives +4 to all stats while soloing, on top if the standard 16 mt and +3 def. Putting the exact same skills on a differend unit won’t grand you the same unit. What makes Walhart strong is his weapon and the strong 37 atk + 36 def. With the weapon effect just providing enough spd/res to allow you to build on that a bit. Making him survive dragons or avoid doubles. Who would you put the exact same skills on? If we take the very thin Axe cav pool, we have Fredrick, who’s pretty much a worse Walhart. You’d have to move to other movement types to find a comparable unit. Similary, I feel Sturdy Stance 4 is a godsent for certain bulky units. Walharts already been discussed. And i will give the same responce as i gave back then: his weapon can be summarized as “gives gen3 armour bst when away from allies”. Stat boosts are nice but cant hold a candle to eff dmg, special acceleration, dc, true dmg and followup/denial. High effective bst can only get you so far if you dont have the skills to back it up. Also they already explained the tier list changes. They wanted to differentiate the top tiers more so they stretched them out, the result what a lot of units droping down. Its due to their sheer lack of good prf weapons. Yeah, just checked the tier list, my boy Boey’s at the bottom yet my build on him let’s him destroy every Zelgius I come against. I didn’t know Karma played Feh. I don’t think you can underestimate the power of stats. You make it seem like stats are useless, but I have to question that. Having high def/res also improves the power of bonfire/glacies. And a lot of these units can be build for special acceleration with breath or blade skills.